The mention was in reference to a recent Bloomberg news report on inmates, their families and their lawyers who have been using Yelp to review prison conditions. Allegations of abuse and long service waits (“Service took forever, was there for 25 years.”) are among the most frequent comments, though there are also reviews of the food available. Apparently, when you’re thirsty and imprisoned in the Arlington County Detention facility, you’ll be given a juice box. Other prisons aren’t as thoughtful. Watch the clip for more food review funnies. 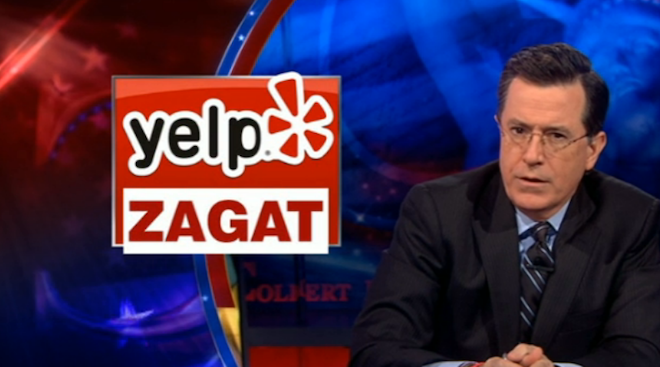 The Colbert Report’s Yelp page.